The season is just beginning we will have in the following weeks plenty of wet salted codfish to supply. 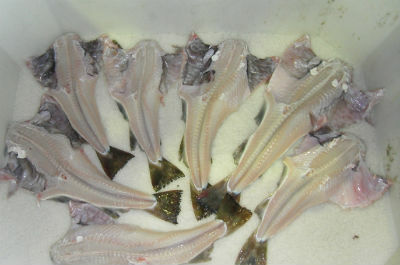 The high quality of our Northern fish wet salted codfish is insured by our selection of the best fresh Fish available. The location of our main processing plant is important to obtain good quality raw material from MSC certified vessels. Our wet salted codfish is produced at our Skjervoy plant. Fishermen deliver directly to our dock, where our facility is fully equipped with the latest technology to quickly split and salt the arriving fresh fish. Due to the extremely low temperature during winter season, we heat up the facility to improve salting, icy temperatures inhibits the penetration of the salt, therefore quality of our salting is insured by a complete supervision of our processing procedures. Every year the first few months we have available many quantities of wet salted codfish, in the following weeks we will have trucks loading almost daily to Europe. Packed in pallet boxes bulk by size, our wet salted codfish is very well cured, very clean well split fish. Due to our location our fish is exceptionally white and with good thickness, ideal for several applications. Unlike most of the Norwegian and Icelandic producers, we cater to our clients offering quantities and sizes they require. With partial shipments possible to several European destinations, we do not force compositions onto our clients, but promote viable options for a win-win solution. For additional information please contact our office. Also, throughout the year we also have available other species besides wet salted codfish, like saithe, haddock, tusk and ling.